Papa John's is getting rid of Papa John. John Schnatter, the founder and public face of Papa John's pizza for more than 20 years, is being removed from all marketing materials at the company after he used a racial slur in a conference call earlier this year. Schnatter resigned from his post as company chairman on Wednesday after the news emerged. He previously helmed the pizza chain as its CEO, but resigned from that post after he blamed NFL national anthem protests for the brand's slumping sales, sparking backlash. He founded the pizza company in 1984, building it up to a global behemoth with 5,200 locations. Now, the chain will scrub Schnatter's image from all of its marketing materials, a company spokesperson confirmed to CNN Money. The Associated Press first reported the move on Friday. It's a thorough re-brand that will see everything from the company's pizza boxes to commercials and restaurants receive a complete overhaul. There aren't any immediate plans to change the company's name, despite the removal of Schnatter's image from its promotional endeavors. 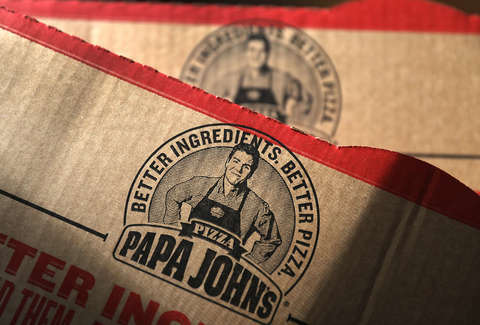 "Papa John’s International, Inc. today announced that the independent directors of the company have accepted the resignation of John H. Schnatter as Chairman of the Board. Olivia Kirtley acts as the company’s Lead Independent Director. Papa John’s will appoint a new Chairman of the Board in the coming weeks." Schnatter and Papa John's have faced backlash on multiple fronts over the founder's racist remark: The University of Louisville announced a plan on Friday to remove the Papa John's name from the university's Cardinals Stadium, while the mayor of Schnatter's Indiana hometown returned a $400,000 donation Schnatter made to restore an historic gym, according to CBS. We reached out to a Papa John's spokesperson for more information and will update this story when they respond.